Have you ever watched a child? Every move they make is instinctual and pure. Most of the time, they're not even conscious of what they are doing. They just move when it seems right. Sometimes it may get them into trouble, but usually, it's just what the body is meant to do. Stand back and watch a child when a song comes on. If it has a good beat, no matter what s/he is doing, the child will likely start bouncing, swaying, or bopping his/her head. He may not be graceful. She may not win the mirror ball trophy on Dancing With the Stars, but they are dancing. Children dance for the pleasure of dancing. They're dancing because it feels good. It feels right. It expresses a joy. It's a visual representation of the music that is invading their bodies. They don't care if anyone is watching them - judging them. They just dance. And usually, they laugh. I always get such delight out of watching my daughter dance. It's so cute. And innocent. Two things we do not usually get to see in the "Real World." It's a nice break from the usual guarded behavior we consistently live with. Most adults are the complete opposite of my daughter when they are put in a situation. But this weekend, I was reminded of her while I was teaching at Dance Flurry. While the event may not be as pure as a child, it does at times seem to come close. I always joke that it's a weekend of peace, love, and dance, but it's true. I have been going to the Flurry for well over 10 years now, and it still amazes me to see such a diverse group of people - of all ages - come together with nothing more on their agenda than to just dance. It doesn't matter what you normally do, or what your "real life" is like. A contra dancer in bare feet can be dancing with a tango dancer in 4 inch heels... and somehow, it's not weird. People step out of their comfort zones at the Flurry and go into whatever room they want to try out. No one judges. No one cares. Everyone is just happy to see you. To dance like a child. No cares. No weight on your shoulders. Doesn't matter what you are wearing. Just close your eyes, feel the music, and laugh. It is rare to see an adult experience that, which seems very sad to me because there's no reason that can't happen. How unfortunate that we now live in such a cynical world that we are so caught up in the requirements of life, we can no longer just experience life itself. How sad that we have lost the ability to tap into that child inside of us and once again experience life through fresh eyes. Even if for just one song, we step in the middle of the floor - leave our cares, our worries, our stress, our age on the edge - and just dance. Feel nothing but the music, the joy, the movement, the freedom... and just dance. I've always said we can learn a lot from children. They are much wiser than we often give them credit for. There's a lot to be said for instinct, we just have been conditioned to shut that off. But perhaps we should pay attention to our smaller peers. Tap back into that instinct, and, even if for only the 3 minutes of one song, just dance. How our life may change. 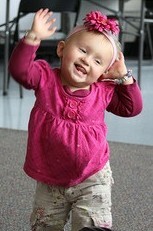 Dance like a child and see how the world will brighten! Reblogged this on <a href="http://josephmccloskey.wordpress.com/2013/02/20/36/" rel="nofollow">josephmccloskey</a> and commented: So true, they haven't yet learned the art of being self conscious. When the big bad world explains to them how important it is to conform they'll learn to dance "properly"
I love this! Thank you for sharing this wisdom. I am going to call forth my inner little girl next time I dance. I think she has a lot to teach me. Such a great perspective here. Thanks again.